Shaun Beveridge, 34, sat still and silent as his defense attorney, Doug Phelps, challenged the state’s narrative, which implicates Beveridge as one of four bounty hunters who in the early-morning hours Sept., 14, 2016, smashed a motel window, gassed the room’s occupants and held them at gunpoint. 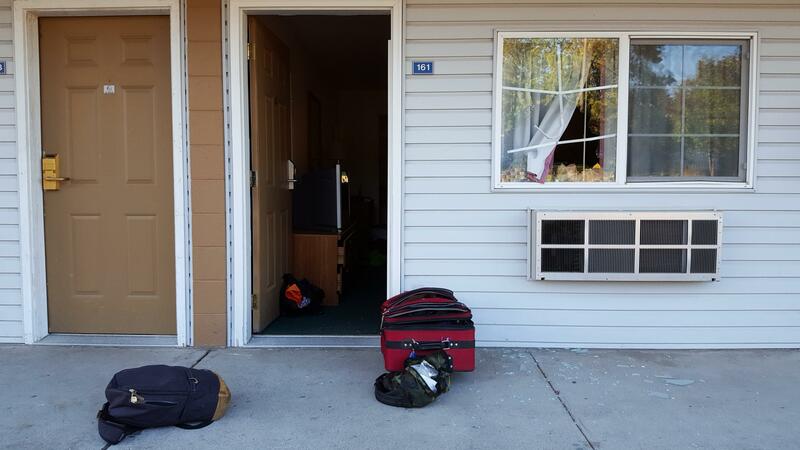 The incident occurred at Econo Lodge, 1503 S. Rustle Road, near the Finch Arboretum in southwest Spokane. According to an employee, the irritant saturated the room and seeped into neighboring units. Beveridge, Reed Alefteras, 24, and Robert Elder, 31, were each charged with unlawful imprisonment and second-degree assault. Police also requested charges against the fourth bondsman, Christopher Petrie, 37, but prosecutors declined. In March, Elder and Alefteras each pleaded guilty to the lesser charge of criminal mischief. In court Tuesday, Phelps told the jury of 13 his client was simply doing his job. He said the bondsmen had reason to believe that Shanda Hanson, who was a fugitive from Kootenai County and who bailed out of jail, was staying in one of the rooms. On the way to confront her and take her into custody, Phelps said, they were followed by an SUV that was “trying to run them over.” When they arrived in the motel parking lot, they saw the driver, who they believed was Justin Jordan, a known acquaintance of Hanson. After observing him enter a room, they checked with motel staff, and noticed the name of the person who paid for the room lined up with another acquaintance of Hanson. The phone number was that of Hanson’s, Phelps said. Phelps said the men called police, who arrived at about 2 a.m. and asked the occupants to come out. When they didn’t, the police left, saying they couldn’t help with out-of-state warrants. The bounty hunters stayed. After further commands to come out that went unanswered, three of the men – Beveridge, Alfetras and Elder – called Petrie, who provided them with a pepper spray canister. They broke the window and threw in the canister, before kicking the door open. Phelps said Hanson then came outside, but Jordan remained barricaded in the bathroom. Guns drawn, the men went back inside to get Jordan and detained him outside until police arrived. Prosecutors, however, said bounty hunters were not legally allowed to detain Jordan, and they say the four men had little if no reason to believe Hanson was in the room in the first place. Hedlund said once the four men made the decision to go back into the room, they broke the law. In Washington, bounty hunters, or “bail recovery agents,” can only detain a fugitive who has signed a contract with their company. Beveridge was working under contract for Quick Release Bail Bonds in Post Falls. Court documents state all four bounty hunters involved in the motel encounter had only the authority to arrest Hanson. Published: April 17, 2018, 4:45 p.m. Updated: April 17, 2018, 8:13 p.m.